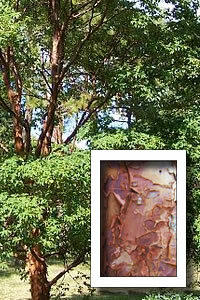 An excellent, slow-growing ornamental deciduous tree with peeling, orange-brown bark. The 3-palmate dark green leaves turn orange, red and scarlet in autumn. Height and spread to 30 feet. Grow in fertile, moist well-draining soil in sun or part shade. This seed has been pre-treated in a germination initiator. Germination trials resulted in 70% germination rate. Seed must be kept moist cold stored.If allowed to dry, the hard seed coat inhibits germination. Soak seed in tepid water for 24 hours. Place seed in baggie with moistened medium (peat and sand) and warm stratify 120 days. Check the seed coat as the outer layer should be easy to remove. Sow 7 mm deep in moist peat/sand mix and cold stratify (or place baggie in fridge) for 120 days. Will germinate under spring-like conditions. If the seed coat is too hard, it may take 2 years for the seed coat (or skin) to soften enough for the embryo to escape. If you allow the stratified seed to dry out, it will kill the embryo.